It’s time for some book coveting! 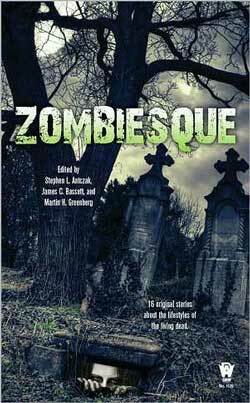 We’re getting a bit swamped with zombie-themed books, but this one I love the sound of and seems to have its own unique perspective. The twist: the protagonists are the zombies. From a tropical resort where visitors can become temporary zombies, to a newly-made zombie determined to protect those he loves, to a cheerleader who won’t let death kick her off the team, to a zombie seeking revenge for the ancestors who died on an African slave ship– Zombiesque invites readers to take a walk on the undead side in these tales from a zombie’s point of view. There are 15 stories in total and it looks like they’ve gotten a great bunch of authors: Nancy A. Collins, Charles Pinion, Tim Waggoner, Richard Lee Byers, Robert Sommers, Seanan McQuire, G.K. Hayes, Jim C. Hines, Sean Taylor, Jean Rabe, Del Stone Jr., S. Boyd Taylor, Loaszlo Xalieri, Nancy Holder and Donald J. Bingle. I’m mainly looking forward to Seanan McGuire’s story, but there are a couple of other ones that look great. I haven’t read most of the other authors, but a lot of them are still on my To Read/Want list. Zombiesque is £6.29 on Amazon.co.uk and $7.99 on Amazon.com.